Can be used for EMS or biofeedback; the only probe that's Kegel8 approved! With 4 electrodes on 2 circuits, the Perisphera U gives you optimum stimulation for your pelvic floor muscles. All electrodes are gold plated, metalised and made in a nickel-free process. There are two, large flat electrodes on the base to provide global stimulation, and two ‘saddle-shaped’ electrodes on the side to offer undifferentiated stimulation to the left and right branches of the pubococcygeal muscle. 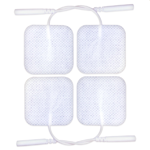 For optimum use, it is advised to use all 4 electrodes, however Perisphera U’s dual channel offers you the choice to use separately when desired. 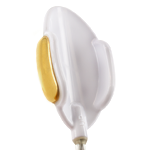 The advanced design of the Perisphera U offers you and your physiotherapists a comfortable, easy to use vaginal probe which has the advantages of global and lateral stimulation during your pelvic floor rehabilitation. The Perisphera probe is made entirely from biocompatible plastic material. The Perisphera U Perineal Probe is compatible with bi-phasic EMG biofeedback, EMS machines or electronic pelvic floor toners such as the Kegel8 Ultra 20, Kegel8 Ultra Vitality and the Kegel8 V For Men NMES Pelvic Toners which use symmetrical waveform, and for professional clinical use. This probe uses two or four wires with a 2mm female banana ending. Probes are provided in a sealed bag with instructions. Perisphera U is 120mm long with 80.5mm insertable length. The probe is flat with 30mm width and 15mm depth. The 4 connective leads are each approx. 20cm in length with 2mm female sockets. The Perisphera U must not be sterilised or autoclaved. It must be cleaned with mild soapy water after each use. It is a CE mark Medical device Class 2a. Because we trust the quality of our probes so much we extend the warranty from the standard 60 uses up to 6 months unlimited usage. Please be aware if you are nickel intolerant we advise the electrode surface be examined before use to ensure the surface has not been scratched during storage. The probe can safely be used for up to 2 years providing all manufacturers recommendations are followed. BEAC Med probes are now officially Kegel8 approved! The superior quality of BEAC Med probes will make sure your exercise routine is clean, hygienic and safe every time. BEAC Med have been designing and manufacturing probes at their Italian headquarters since 1981; their range is expertly engineered to fit a huge variety of needs and body types, with unparalled conductivity. Maximise the effect of your kegels with a BEAC Med probe! 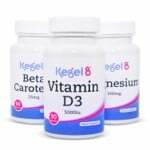 The Kegel8 Ultra 20, Kegel8 Ultra Vitality, Kegel8 V For Men, NMES Pelvic Toners which use symmetrical waveform, and for professional clinical use, including Biofeedback. Clean using Kegel8 Cleaning Spray and pat or air dry. Can be cleaned with warm soapy water (do not sterilise). Chemicals will erode gold plating and invalidate warranty.